Our incredibly secure platform features options for single, recurrent and guest donations. Wigiv offers your members the ultimate level of convenience with multiple accepted payment methods, including: credit or debit cards, and bank accounts. This section of the app allows each member to see all of their donations as they are made in real time, whether single or recurrent, and the exact amount that was processed - we call it the instant receipt. Members will have unrestricted access to all your latest posts, photos, events and more. All new content is previewed using push notification technology, and shown across all your social media pages. There are people in your community that want to get involved. Make it easier for them. Our app displays a list of all available volunteer spots, making it that much easier for your followers to do their part and get involved. Members will be instantly notified with updates on all new events, with pictures, descriptions, exact dates and locations. They will also have the ability to confirm their attendance so you can receive an exact headcount of attendees in real time. Get full access to member profile data, which can be used for future reference and edits. We’ve made it easy for you to broadcast live events, services or simply build your own library of memorable events to share with members. With live events videos your app follows your members wherever they go, even when they are traveling or on vacation. Sharing is the best way to raise awareness and increase the number of participants. 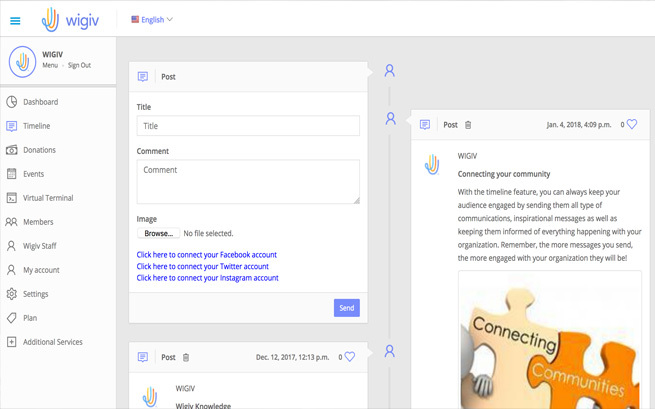 With Wigiv, you can seamlessly share all timeline content, invite others to join and so much more. The same great features and benefits, but with more. Now you can completely customize your app for a full-fledged, personalized branding experience. 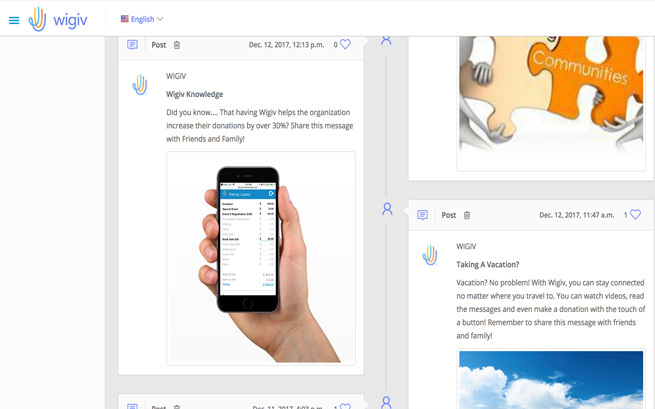 With Wigiv’s fully-loaded admin panel, you gain complete control over your app. 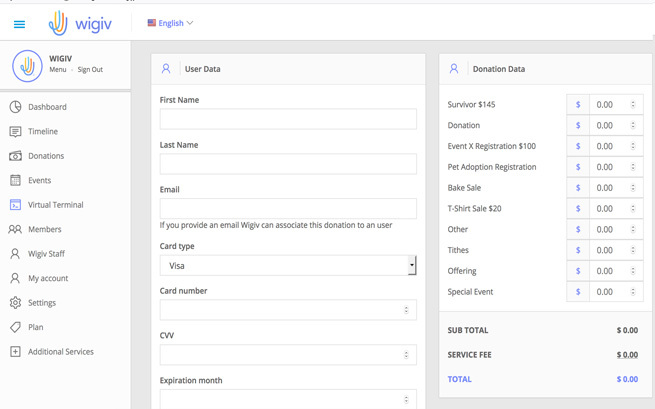 Now you can easily manage all content, monitor donations and oversee member activities for reporting and tax purposes. 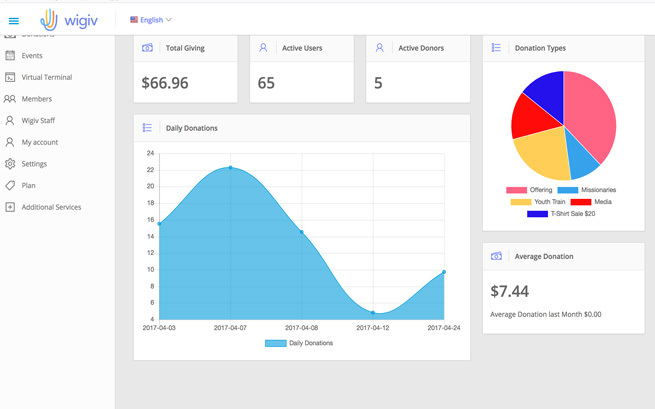 The one place where you can monitor total giving, users, downloads and so much more – all done from a centralized page where all your relevant data lives. Create and send content, messages, photos and so much more through your portal. Have multiple social media platforms? 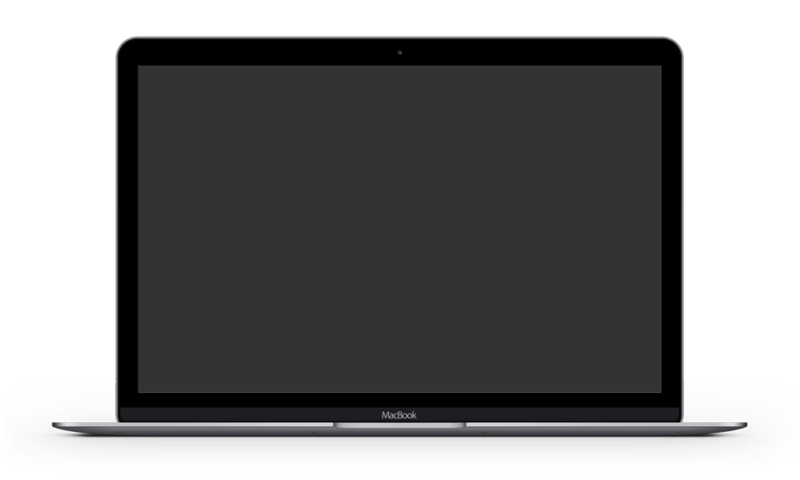 Our centralized control panel lets you seamlessly share content across all of them - It’s as easy as 1, 2, 3. It’s easier than ever to create events, upload pictures and add descriptions. Receive a real-time headcount of who’s attending, who’s not and who might be. 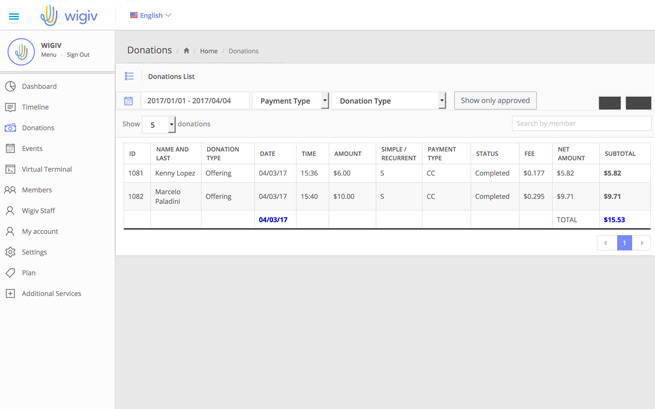 Now your admin can run filtered reports in a variety of ways, including: donation type, payment type, by member and status. We’ve simplified the process of creating tax reports, it just takes a few clicks. Wigiv makes it easy to process credit card transactions that were obtained manually from members. Everything can be done in one place, from your portal. 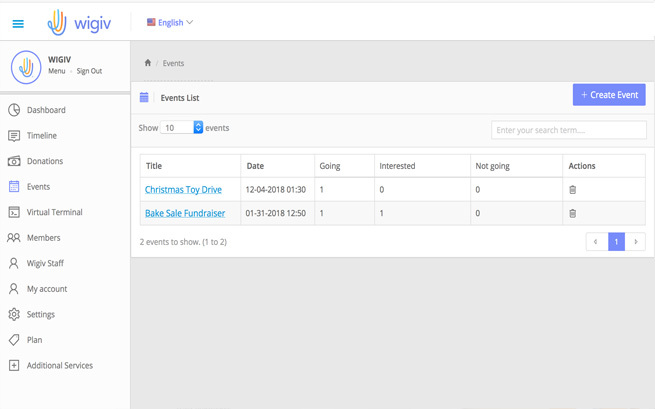 A centralized tab where you can manage member information such as: personal addresses, emails, phone numbers, attendance and availability for volunteering positions. With Wigiv, you benefit from multi-level access. Now personnel across your organization can collaborate at different levels, depending on their role. We’ve taken the control and put it in the palm of your hands. This is the heart of your content, where donation types, volunteer opportunities and video uploads can be monitored and controlled. Additional services: Need more services? You can request them right here! We offer everything from next-day funding and added payment methods to simple cash advance requests. 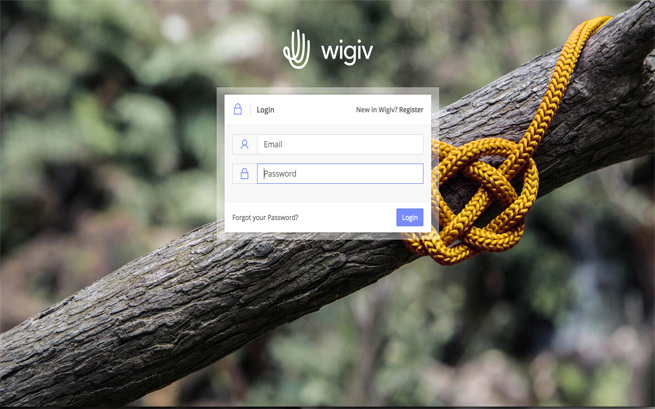 Wigiv has everything you need and more. It’s always been our goal to offer our customers the most competitive cash advance program in the market, that’s why we’ve partnered up with ePayData funding. Wigiv understands that when you are committed to a greater purpose, your time is limited and we don’t want you to spend it searching for funds. You have confidence in your donors, but your bank doesn’t have confidence in you – good thing we do. Our cash advance system helps you get the money you need, exactly when you need it, because Wigiv wants to see you succeed. From you Wigiv panel, go to “Cash Advance” – “Request advance”, and enter all additional information requested. Aftera cash advance has been requested, we will immediately contact you over the phone to finalize your application. It just takes a few simple steps.Once your application has been process and approves, we will deposit your funds directly into your bank account. This only takes a few business days. We use a factor rate of 1.20 (or less depending on credit worthiness) to calculate the amount of your cash return. During the next 6+ months after receiving your advance, you will be discounted approximately 20% of every daily deposit, until the full amount is paid back in full. 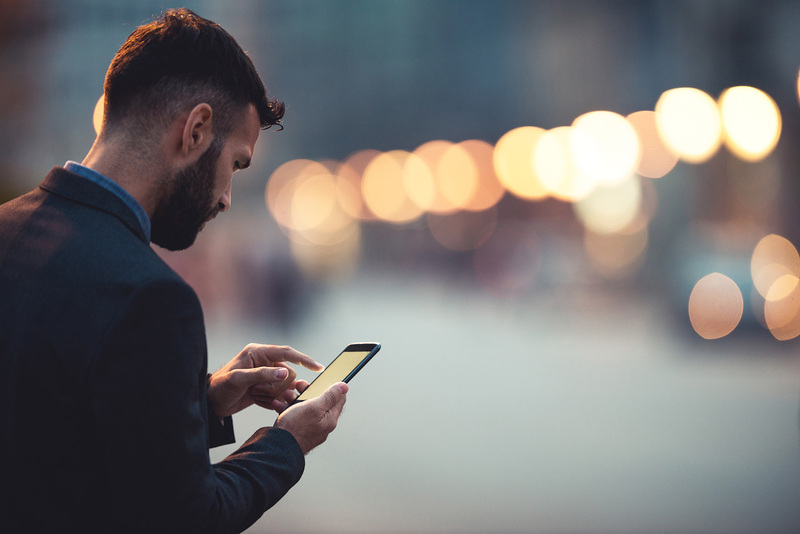 We understand that ever changing times and security challenges that mobile transactions represent. Therefore, security has been always a top priority for WIGIV. We have designed a solution to provide our customers and users with the peace of mind that would help them feel eager to keep growing your organization. Simply put, we are Safe, Trusted, Reliable and Strong. We use different data encryption technologies to ensure each transaction travels safe and encapsulated to its intended destiny. At the same time, we have in place several monitoring systems that will alert our team of any suspicious activity. We are certified PCI Compliance Level 1 or PCI DSS (Payment Card Industry Data Security Standard), meaning that the banking and financial industry trust us to do transactions with them.We proudly hold this certification since 2014 when Trustwave granted us with it. We have designed our systems around the odd that one day a meteorite can hit our server’s facility. Reason why, we have mirror servers farm across different locations to ensure an optimal uptime and system response. Yes, we have an awesome system, but is also very strong. They idea behind is for our system to be ableto serve multiple simultaneous transactions and to keep growing as needed. We can increase our operational capacity at any given time; this to ensure you that we are capable to handle any high peak of transaction and requests.